Project Size | 23,000 s.f. 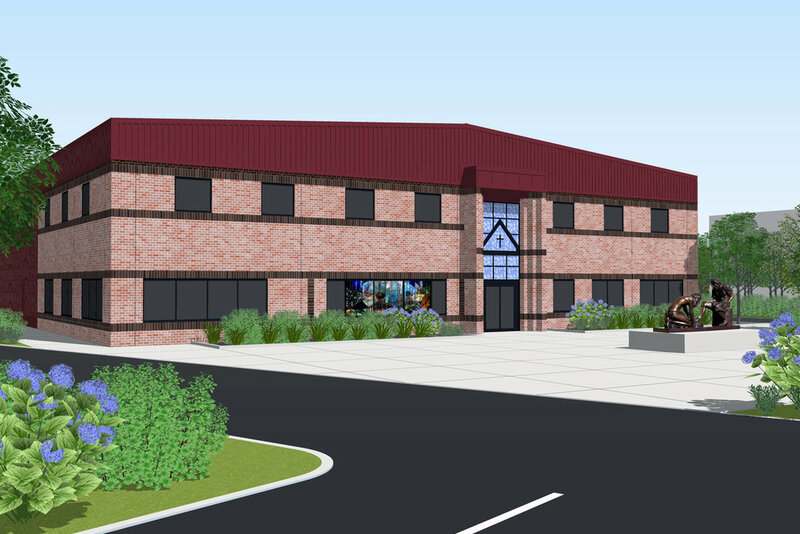 Designed a brand-new facility that incorporated warehouse space, office/administration space, a chapel, dining facilities, and support facilities for visiting volunteer staff. Combined pre-engineered and custom-built elements into one coherent, cost effective structure while maintaining specific “branding” elements typical of previous existing facilities (colors, materials, etc.). Wessling Architects was hired to design their new 23,000 square foot office and warehouse building to provide space for the growing volunteer community of My Brother’s Keeper and to help them meet the increasing need for services across the South Shore. Inspired by the ministry’s Easton Facility, the new Dartmouth Facility was designed closely with the client to promote a sense of oneness among the My Brother’s Keeper Community. Along with resembling the existing facility some of the main goals were to bring in natural light through translucent panels in the warehouse, provide ample space in a new mezzanine for the production of box springs, and utilize the ministry’s colors in exterior and interior finishes.